This page does not represent an official position of the Lycée Classique de Diekirch or the Ministry of Education on climate change and global warming. The official position of the Ministry of Environment of Luxembourg can be found here. If you do not want to read the following links and discussions, please go back! Working for clean air and an unpolluted atmosphere is a laudable aim, but forgetting to compare the magnitude of man-made pollutants to the natural sources, or having an absolute faith in measurement data of often dubious origin, is unscientific at least, and foolish certainly. The climate is "the changing state of the atmosphere", so do not expect a steady state situation. Do not forget either that the sun is the engine which drives everything, and that the output of that engine is in constant change! Global Warming: Policiy Hoax versus Dodgy Science Dr. Roy Spencer has an excellent article in his blog: "...the EPA found itself in the precarious position of possibly outliving its usefulness. So, the EPA embarked on a mission of ever-increasing levels of regulation.the risk of over-regulating pollution is that you end up killing more people than you save, because if there is one thing we know kills millions of people every year, it is poverty.". A real must-read! Interview Prof. Vincent Courtillot Interview ( in French, April 2016) with Prof. Vincent Courtillot on his latest book "Nouveau Voyage au Centre de la Terre". An imporatant part is on how the latest research (by his team and others) show the big influence of solar activity (radiant and magnetic) on global temperatures : "les prévisions qui faisaient suivre la température non pas le soleil mais le gaz carbonique...elles se trompent beaucoup". Peer review: Why skepticism is essential Donna Laframboise, a well-known Canadian journalist, wrote a very extensive and clear paper on peer-review: Only a small part touches climate science, the majority is a very lucid exposé of what went wrong since the second half of last century. A time when the number of papers published became the exclusive metric for scientific achievement. As it is now common that over 50 percent of published peer-reviewed research can not be reproduced, the arrogance of equating peer-reviewed with truthiness should be questioned.The RetractionWatch website has a stunning interview on computer-generated fake peer-reviews. After SCIgen, this seems to close the circle of fake academic publishing. Time to reread the famous 2005 essay of John Ioannidis "Why most published research findings are false" which contains this wonderful corollary "The greater the financial and other interests and prejudices in a scientific field, the less likely the research findings are to be true." Global Warming versus Global Greening. Watch this crystal-clear presentation (40 minutes) given by Lord Matt Ridley at the GWPF the 17th October 2016. This is one of the best presentations of the last years, resuming nicely all arguments of the climate-realist people regarding anthropogenic climate change and the supposed ravages brought by (slightly) higher atmospheric CO2 levels . South Australia had a "black event" (= total electricity power breakdown) during a heavy storm period the 28 Sep 2016. The preliminary report of AMEO (Australian Energy Market Operator) says the cause may be sudden power loss from wind turbines: "..at 16:18, following an extensive number of faults in a short period, 315 MW of wind generation disconnected...The event resulted in the SA regional electricity market being suspended." This comment writes that "The state’s capacity to produce its own baseload power from fossil fuels has rapidly diminished...The combined lost capacity of 1250MW represents a third of the state’s generating potential"
Heartbeat of the Sun from Principal Component Analysis and prediction of solar activity on a millenium timescale A new paper in Nature Science Reports by Shepherd et al. predicting (as many others do) a coming "Maunder-like" global cooling period due to a decrease in solar irradiance and magnetic activity. The authors point to a possible ~30-year long global cooling starting in 2020 approx. What makes this paper also interesting is that many scientists tried (in vain) to prevent its publication, as it goes against the "consensus" primarily CO2 induced global warming theory (watch here). Klimaschutzplan 2050 A preliminary version of the German (69 pages). No comment after a quick reading, but count the occurrences of the word "ambitioniert" (ambitious). Cause of Global Climate Change Excellent paper by Dan Pangburn. He shows that global temperature anomaly can be modeled with good precision as driven by the integral of the sun spots number SSN and that of a combination of PDO, ENSO and AMO oceanic oscillations. His conclusions: "CO2 can not cause significant climate change...Long term prediction of average global temperatures depends primarily on long term prediction of sunspot numbers." Note that this paper suggests a coming cooling, in line with many others. Modulation of ice ages via precession and dust-albedo feedbacks Very interesting paper by Ellis & Palmer published in Geoscience Frontiers:. The authors conclude: "The greenhouse attributes of CO2 play little or no part in this complex feedback system." Read discussion in the blog. "La transition énergétique : science ou idéologie ?" Exceptional conference given by Drieu Godefridi (in French) before a group of the HEC. "Il est désormais considéré comme normal, voire souhaitable, que la norme de droit sous ses différentes formes s'immisce jusque dans les sphères les plus intimes de la vie des individus, pour régir leurs rapports entre eux, avec la nature, avec leur propre corporéité...Le seul facteur — le seul — qui explique la translation massive des entreprises du fossile vers le renouvelable est la subvention publique." Western Pacific hydroclimate linked to global climate variability over the past two millennia New blockbuster article in Nature Communications: " the deep tropics may have played a more active role in global climate change than previously assumed...it is more likely that the LIA global cooling was initiated by a decline in solar irradiance...the La Nina-like pattern is thought to be a factor contributing to the recent so-called ‘warming hiatus’ and earlier twentieth century cool and warm decades...the paleodata-model mismatch supports the possibility that unforced, low-frequency internal climate variability (that is difficult for models to simulate) was responsible for at least some of the global temperature change of the past millennium". Comment here. Lessons from technology development for energy and sustainability. Outstanding and crystal clear paper by Cambridge professor M.J. Kelly. See also this report he published as a GWPF paper. Prof. Sir McKay: his last interview Watch this interview of former Cambridge Prof. Sir McKay given shortly before his death. He says that "Solar and wind only ...that is an appalling delusion that people have...For UK carbon storage and nuclear are the solution...". McKay is the author of the famous and hugely successful book Sustainable Energy.. without the hot air. (link to free PDF version). Look here for a link to a presentation given by McKay at Oxford University "Why climate change action is difficult and how we can make a difference". (watch carefully: he clearly says in the climate science part "we do not know if the models are right"). Read also this blog-post on life-time costs of renewables. GREENING of the Earth and its drivers (mostly enhanced atmospheric CO2). New inconvenient paper (pay-walled) by Zaichun et al in Nature Climate Change. Trend in LAI (leaf area index) is +0.07, 70% of which are due to CO2 fertilization. Look also at this presentation by the author, this GWPF report, this video by Matt Ridley, these comments at climate etc. and here on the future crop yields in Germany. Arctic Ocean methane does not reach the atmosphere. New paper by C.L. Myhre defuses another fashionable alarmist scare. "We find that summer methane (CH4) release from sediments west of Svalbard substantially increases CH4 concentrations in the ocean but has limited influence on atmospheric CH4 levels". Read also here. The Need for Basic Energy Research. Excellent article by Adelbert Goede in EuroPhysicsNews: "...climate models, the basis of the politically negotiated limit on earth surface temperature, are far from perfect....Public money is spent on deployment of today's technology: As a consequence, perverse feed-in tariffs, destructive cross-border transport and wasteful overcapacity characterise this corner of the renewable energy market"
Physiological and ecological factors influencing recent trends in the US forest health responses to climate change. New paper by Craig Loehle et al: Physiological and ecological factors influencing recent trends in United States forest health responses to climate change (link to abstract, paper is pay-walled): "We find that plants can shift their optimum temperature for photosynthesis, especially in the presence of elevated CO2, which also increases plant productivity." "... the actual change of the fundamental metric of the greenhouse warming signature – the bulk atmospheric temperature where models indicate the most direct evidence for greenhouse warming should lie - is significantly misrepresented by the models". Video of hearing. ... a well known and respected professor (retired) at the James Cook University, passed away aged 74. He was an excellent speaker, a climate realist debunking myths and lies. Read more here at Jo Nova's blog, at Wattsupwiththat and Ian Plimer's obituary. Here one of his papers: The Myth of Dangerous Human-Caused Climate Change (which contains a link to meteo.lcd.lu). "Climate change is a wicked problem....The climate change problem and its solution have been vastly oversimplified"
Ditch the 2°C warming goal! Now that COP21 is over and everybody is happy for a less than 2°C future, it is time to reread a comment published in NATURE in October 2014: ".. the 2°C goal is impractical. It is related only probabilistically to emissions and policies, so it does not tell particular governments and people what to do". Read this comment from Björn Lomborg. Amazing surge in scientific hype Scientific American: "... scientists may assume that results and their implications have to be exaggerated and overstated in order to get published…"
The Truth about China A new must-read report from Patricia Adams: "China’s leadership knows that what China says to the West is more important than what China does, absolving it of the need to make any binding commitment to reduce its carbon dioxide emissions"
Global temperature trends adjusted for unforced variability. New and very readable paper by Craig Loehle: By substracting scaled AMO data from Hadcrut4 global temperatures, Loehle finds a post 1970 linear trend of 0.83°C/century (much less than the IPCC): "No support for accelerated warming can be seen in these data after 1970 ". Comité des climato-réalistes In France a new group, the "comité des climato-réalistes", has sprung into action. Look here for its website and the long list of people who agree with it (most have an academic background). The Belgian site Belgotopia has a list of 550 "IPCC-sceptic" scientists ". Inconvenient truths for the environnemental movement Article in the Boston Globe by Goldstein and Pinker: "...until now, fossil fuels have been good for humanity...Nuclear power is the world’s most abundant and scalable carbon-free energy source...Without nuclear power, the numbers needed to solve the climate crisis simply do not add up." A very interesting paper by Ari Halperin showing that on a multidecadal scale, the carbon surplus injected into the atmosphere (by human activity for instance) has a half-live of about 40 years, much lower than the "consensus" value used by the IPCC. One of his conclusions (see here) is: "If stabilizing or decreasing atmospheric CO2 content becomes desirable at some point in the future, that can be achieved by decreasing anthropogenic CO2 release at that time; no premature action is needed." Halperin's short bio is here. Open Letter by a group of Belgian scientists before COP21, stating as was to be expected, the absolute urgency of immediate action. Expect more of similar statements flooding in. Watch this statement (in French) of Prof. Vincent Courtillot of the French Académie des Sciences. The Texas Policy Foundation ... has organized two "At the Crossroads" days (19&20 Nov.2015) with many interesting presentations which are available online. Click here then the "On-Demand" tab. I recommend the presentations of the former NASA astronauts and scientists of the "The Right Climate Stuff" starting Friday 11/20/15 at 08:35 am (click on that text) at time 00:15:00 up to 01:04:00. Also the previous day Friday 11/19/15 at 1:15pm (click on that text) the presentation of Don Easterbrook (start 00:32:00) and those of William Happer and Richard Lindzen (start at 01:00:00). Impacts of Current Climate Policies. Read this new paper (09Nov2015) where Blörn Lomborg calculates the global temperature reductions resulting from COP21 planned policies. He uses the open MAGICC climate model (you may try it!) and finds ridiculously low reductions. Should we celebrate CO2 ? Read the annual GWPF lecture given by Dr. Patrick Moore, one of the Greenpeace founders, the 14 Oct. 2015: "I submit that much of society has been collectively misled into believing that global CO2 and temperature are too high when the opposite is true for both." Video of lecture. 9 Fragen zu Kernkraftwerken Read this very sober and clear paper by Prof. Lüdecke et al. (in German). Mass Gains of Antarctic Ice Sheet Greater than Losses .... says NASA in a new report (full text here): "The good news is that Antarctica is not currently contributing to sea level rise, but is taking 0.23 millimeters per year away". Read also comments at WUWT. How inconvenient to COP21! Scientific Dispute in Climate Science Adjudicating Excellent paper by Prof. Lucas Bergkamp from Erasmus Uni. Rotterdam: "Unthinkingly rubberstamping consensus science is not a good practice... ...consensus that is based not on persuasive argument, but on silencing dissent by inappropriate means, is not worth anything...if an area of science is politicized, consensus may not signal the state of the science, but political dominance ... Courts should also be aware that consensus science, which is invoked by policy advocates only if it supports their cause, is not a reliable guide, because it may reflect science power politics, ‘group think,’ political pressure, or be biased for other reasons." (h.t. Climate etc.) Read also here! 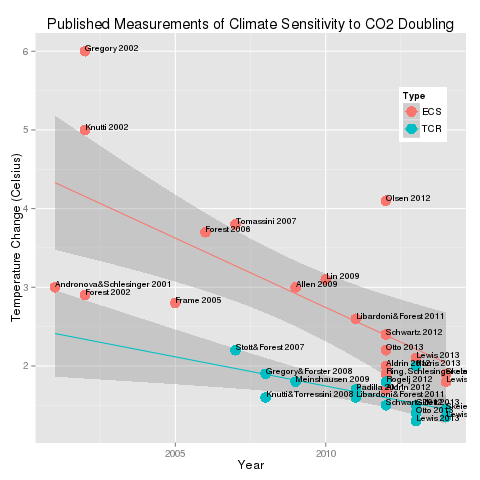 Equilibrium climate sensitivity: feedback or feed-forward? Very interesting discussion by Swiss author Michel de Rougemont on climate sensitivity: "How can one be so wrong for such a so long time? Too much consensus? Too much to lose? Or ironclad tribal discipline?" (h.t. climato-réalistes). Can convection neutralize the effect of greenhouse gases? Very interesting article by Stephen Wilde at JoNova's blob. New Economics of Oil Crystal clear presentation by Spencer Dale, chief economist of BP: " Oil is not likely to be exhausted: As such, there shouldn’t be a presumption that the relative price of oil will necessary increase over time. " Deserts: are they expanding or shrinking? Report from CO2 Science, Oct. 2015. "As with most of the rest of the world, therefore, as global temperatures go, so also goes the greening of the Earth... driven directly by the ongoing rise in the airs CO2 content, and possibly indirectly by warming-induced alterations in global precipitation patterns"
Carbon Dioxide: the good news Read this new report by former IPCC author Indur Goklany.
" Models used to influence policy on climate change have overestimated the rate of warming, underestimated direct benefits of carbon dioxide, overestimated the harms from climate change and underestimated human capacity to adapt so as to capture the benefits while reducing the harms." Do not miss the excellent foreword by Prof. Freeman Dyson and this interview: "That is to me the central mystery of climate science. It is not a scientific mystery but a human mystery. How does it happen that a whole generation of scientific experts is blind to obvious facts?" Global warming and climate change: Separating truth from fiction Excellent essay by Murray Hunter: (h.t. Prof. Judith Curry at Climate Etc. ): "Carbon emission controls and other political solutions will not solve any of our real problems." How reliable are climate models? asks Mike Jonas at Wattsupwiththat: "The reality of course is that two-thirds of the predicted future warming is from guesswork and they don’t even know if the sign of the guesswork is correct"..
Science isn't broken With all the Hoopla about Nasa's report on sea level rise, read this sober comment. There is nothing unusual happening...except that the date of the Paris COP21 is approaching fast, and scaring drumbeats will follow with increasing speed! Read also: this presentation, Sonel graph1, graph2, this video, this talk by Prof. Nils-Mörner and what Stanford University says. Climate Science turned Monster A new McCarthyism in the USA? Read Dr. Tim Balls comment on the letter signed by 20 scientist calling to apply RICO to scientists who do not agree to the "consensus". Read also here , here, here. Judith Curry writes: "What you have done with your letter is the worst kind of irresponsible advocacy, which is to attempt to silence scientists that disagree with you by invoking RICO. It is bad enough that politicians…are playing this sort of political game with science and scientists, but I regard it as highly unethical for scientists to support defeating scientists with whom you disagree by such methods." Cosmic Theories and Greenhouse Gases as Explanations of Global Warming New interesting paper by A. Ollila form Aalto University: "...the greenhouse gases can not explain the ups and downs of Earth's temperature trend since 1750...but the space dust changes do it very well". More on my blog! 45 minute video by David Dilley, CEO of Global Weather Oscillations Inc., and former NASA meteorologist. The Truth about CO2 Dr. Patrick Moore, co-founder of Greenpeace, has an excellent 4'30" video from the Prager University. This is an absolute must-watch! Statement by Prof. Hans von Storch Read this statement made at a Symposium at Nottingham University: "In environmental sciences, exploiting scientific understanding as key argument for specific decisions is common in recent decades, with the effect that the public is getting “resistant” to the cacophony of newest scientific claims that this-or-that catastrophic development if this-and-that is not done. In effect this is the expected result of an unsustainable use of the capital of science." Sustaining the Wind David Jones has a very interesting 5 part series at Brave New Climate. Parts 1 and 2 are available. Read also his paper on World Energy Demand and Uranium. The Green Scare Problem Matt Ridley in the WSJ: "Making dire predictions is what environmental groups do for a living, and it's a competitive market, so they exaggerate.."
New study finds no link between child asthma and urban living. Read comments here. Sahara desert greening. Satellite data shows that indeed during the last decade, the Sahel is becoming more green. Read also here and here. New study from A. Fisher et al. measures heat flow at the base of West Antarctic ice sheet much bigger than assumed. See blog comment here. Climate sensitivies down trend (link to graph) Read here how new research papers continuously find lower climate sensitivities for a CO2 doubling: do you really think that this science is settled? Regional climate impacts of a possible future grand solar minimum New interesting paper by Ineson et al. Finally "main-stream" researchers acknowledge what climate realists have said since many years: the solar influence is badly misrepresented in the official IPCC politically correct science! Read also my comment in the BLOG. read also this new paper by Usoskin showing that the Maunder minimum really ...was a grand minimum! Read here the 2013 paper by Abdussamatov "Grand Minimum of the TSI leads to the Little Ice Age". Look at figure 8 ! "Global Warming has become a religion....Global Warming is a non problem...Mr. President (Obama), you are dead wrong!...We have to stop wasting huge amount of money on climate change...it's not sustainable"
Here is the Mainau 2015 declaration on climate change, that was signed by only 56% (35 out of 66)of the nobelists! German Green Power forces neighbors to bolster blackout defenses. Blomberg:"Trading stops have exploded since the fourth quarter, especially on the import side"
The human triumph of fossil fuels. By Indur Goklany. The Climate Debate in the USA Presentation by Prof. Judith Curry made at the GWPF: "My concern is that we have over-simplified both the climate change problem and its solutions". LAUDATO SI Full text (with my highlights) of the encyclical. Excellent comment by Indur Goklany: The Pontifical Academies' Broken Moral Compass: "But it is a strange moral calculus that endorses policies that would reduce existing gains in human wellbeing, increase the cost of humanity’s basic necessities, increase poverty, and reduce the terrestrial biosphere’s future productivity and ability to support biomass, all in order to solve future problems that may not even exist ." Read here a new GWPF report by Bishop Peter Forster and Bernard Donoughue "The Papal Encyclical: A critical Christian response": "To us the encyclical is coloured too much by a hankering for a past world, prior to the Industrial Revolution, which is assumed to have been generally simpler, cleaner, and happier. There is little historical evidence for such a vision, and for most people then life was brief, painful, poor, and even brutal." Less than the sum of its parts Very interesting article on how solar drives out wind: increasing the PV power part in a renewable wind & solar mix decreases total available low carbon power! "Its time to pick some winners, and support for renewable energy at scale should increasingly favour wind over solar. And we should also think about how to decarbonise the remaining eighty percent of the grid that variable renewables can’t touch." Emeritus Prof. William GRAY (Colorado State Univ.) has written a very interesting paper about the wrong water-vapour feedback and missing ocean influence in the global climate models. He shows that the water vapour feedback is small but negative, and that the warming to be expected from a doubling of atmospheric CO2 will be about 0.2 to 0.3 °C ! The Future Role of Coal Extremely clear and well written paper by Dr. Frank Umbach from King's College (University of London): "While Germany’s 2006 decision to phase out hard coal mining and production by 2018 may reduce its national CO2 emissions more drastically by 2020, it has directly led to carbon leakage in Russia...According to most energy experts and international energy organizations, a world without coal-fired plants is unrealistic through 2040"
The unintended consequences of European climate policy Georgia's trees are cut down to make wood pellets for European green heating. Germany's 2020 greenhouse target not longer feasible "Politically troublesome regulations of coal power plants will merely result in cuts in emissions that are one tenth of what is needed." Read also the EEA report on legal pollution limits exceedance: "Germany was the only country that exceeded 3 of the 4 emission ceilings"! Emissionshandel braucht Schutz vor Politikern Read this comment in the Frankfurter Allgemeine. Read also this comment from Dirk Maxeimer: "Man kann mit dem sogenannten Klimaschutz alles rechtfertigen, jedes Verbot, jede Steuererhöhung, jede noch so stümperhafte „Energiewende“"
Potential for Worldwide Displacement of Fossil-Fuel Electricity by Nuclear Energy in Three Decades Based on Extrapolation of Regional Deployment Data Qvist & Brook have published a very interesting paper based on Swedish data. They show that all the fossil-fuel derived electricity could be replaced by emission-free nuclear electricity in 24-24 years! (free access to full paper at PLOS one). Caustic article in the "Wirtschaftswoche" condemning the German Energiewende: "Bereits jetzt bestimmt eine Republik der Öko-Stromräte festgelegte Planpreise, Solar- und Windgenossen produzieren Willkürmengen, die Bevölkerung zahlt Zwangsabgaben, Angebot und Nachfrage sind außer Kraft...Eine schmarotzende Szene aus Förderantragsexperten, Investoren, Anlagenbauern und Subventionsverteilern treibt das Geschäft munter voran...Diese Energiewende in ihrem Lauf, halten weder Ochs noch Esel auf." Read also here and watch this video (presentation by Dr. Ziegler, Vernunftkraft e.V.). Enforcing Eco-Orthodoxy Down Under Intolerance at UWA (University of Western Australia): read this Spiked-Online comment :" The massive stink over Björn Lomborg... shows that the spirit of McCarthyism lives on." Manifesto Is "Ecomodernism" a new trend in intelligent green thinking? "Urbanization, aquaculture, agricultural intensification, nuclear power, and desalination are all processes with a demonstrated potential to reduce human demands on the environment, allowing more room for non-human species." Climate Control - Brainwashing in Schools A. Montford and J. Shade wrote a very interesting report which was published as the GWPF report #14 . Even if this report analyses the curricula in UK, it makes for an interesting reading: "There can be little doubt that the provision of a rigorous education has now givenway to a highly politicised brainwashing of growing minds with ‘climate change’ and energy scares as motivators and ‘sustainable development’ as the ‘solution’ . Gone are the days when the education system hoped to generate young people equipped to form their own opinions on complex scientific, sociological and political issues." Interview with Freeman Dyson Watch this interview on climate change and the role of CO2 (interview made in the "Conversation that Matters" series of the Vancouver Sun paper): "Not any of these (climate) models can really ever be predictive... CO2 is so beneficial in many ways, it would be crazy to try to reduce it". Biography of this outstanding scientist here. Predictions made for the first Earth Day in 1970 Now that Earth Day 2015 is over, here are the predictions made for the first Earth Day in 1970, and don't fall over from laughing. The morale: do never believe in predictions! Tree-Ring Amplification of the Early-19th Century Summer Cooling in Central Europe A new inconvenient paper, by U. Büntgen et al. Abstract (full paper in the AMS Journal is pay-walled): "All records independently reveal coolest conditions in the 1810’s and warmest after 1996, but the ring width-based reconstruction overestimates the intensity and duration of the early-19th century summer cooling by ~1.5 °C at decadal scales"
Fast breeders Future nuclear energy developments may be based on fast reactors (fast breeders) which are excellent in fuel economy and can deliver very short lived waste, compared to the classic U235 reactors. 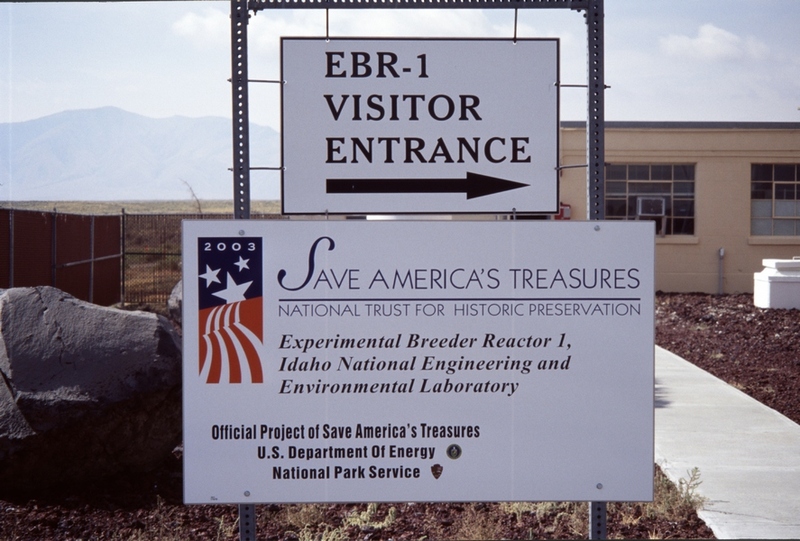 I stood on the EBR-I, the first experimental sodium cooled fast reactor, which is now a museum in INL (Idaho National Laboratory). It's follower EBR-II worked flawlessly for 30 years. Read here an historic comment by Dr. John Sackett, who also worked on the IFR (Integral Fast Reactor). India and China are busy testing different reactor designs, as both countries acknowledge that nuclear power will probably be the only emission-free solution that is non-intermittent, sustainable in soil occupation and easily scalable. Look here for a table of all on-going nuclear constructions worldwide. Climate change availability cascade :Read this comment by Prof. Judith Curry: "An availability cascade is a self-reinforcing process of collective belief formation that triggers a self-perpetuating chain reaction: the more attention a danger gets, the more worried people become, leading to more news coverage and greater alarm.... Is climate change making us stupid? I fear that the answer is ‘yes.’"
Hydrogen fuel-cell cars An easy to read article on fuel cells, which might well crush the pure electric vehicles. Windiges Geld The German NDR TV aired an emission on wind parks in northern Germany. This calm, non aggressive reporting tells us that investors in wind parks are promised an ROI of 9.86%. This extraordinary number is possible through the (over?) generous German EEG, and shows why German sky-rocketing electricity prices are now close to 30 Cent/KWh (h.t. denis). Here a small report on the German PV and Wind electricity contribution to the national production from 2011 until today, and here the live production data. And here an interesting report by Agora on negative electricity prices (wind turbines will be put on hold when price < -65 €/MWh). Fossil fuels will save the world (really) Matt Ridley in WSJ: "Wind power, for all the public money spent on its expansion has inched up ... to 1% of world energy consumption in 2013. Solar for all the hype has not even managed that....The one thing that will not work is the one thing that the environmental movement insists upon: subsidizing wealthy crony capitalists to build low-density, low-output, capital-intensive, land-hungry energy schemes..."
The political assault on climate sceptics. Read Prof. Richard Lindzen's comment in the Washington Post:"Billions of dollars have been poured into studies supporting climate alarm... So it is unsurprising that great efforts have been made to ramp up hysteria, even as the case for climate alarm is disintegrating". On natural climate variability and climate models. Read Dr Roy Spencer's ***excellent***comment: ": "Models that ignore natural sources of warming must be tuned to be too sensitive, in order to explain the observed 1970s-1990s warming with increasing CO2 alone (or nearly alone). 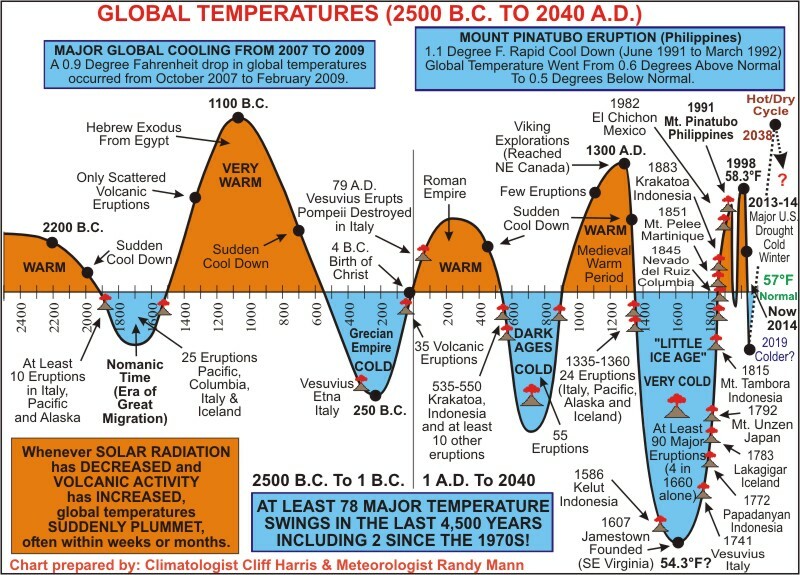 They then produce too much warming in future decades"
Chart of the global temperatures from 2500 BC to 2040 Look at this chart of the global temperatures from 2500 BC to 2040 (extrapolated). Does this chart really enforce the conclusion that atmospheric CO2 and human CO2 emissions drive global temperature? (link)Read also this comment (in German) by Prof. Lüdecke. Climate Change as a Political Process An exceptionnel clear PhD thesis by former Finnish member of EU parliament E-J. Korhola . Read at least the Afterword starting at page 291: "The relationship between science and politics has been problematic in climate science.... Climate change became the next grand narrative after the Cold War...it bypassed many concrete and severe problems and a record amount of attention and resources were sacrificed to it." Read also the comment of Roger Pielke Jr.
Hubert Lamb and the transformation of climate science. Excellent new paper by Bernie Lewin on the great climatologist Hubert Lamb, founder of the CRU, and an outspoken tenant of natural climate cycles and variations who wrote: " ...a tremendous effort was made to land research funds in all countries...on the basis of frightening people about the possible drastic effect of Man's activities, and so much has been said about climate warming that there will be an awkward situation if the warming doesn't happen or not to the extent predicted." Cold water on CSS (Carbon Storage and Sequestration) A MIT study finds that only a much smaller part of the injected CO2 is mineralized, and that more than previously thought remains in liquid or gaseous form, and as such may possibly find its way back to the open. Klima macht Geschichte A mostly excellent series as been aired by German national television ZDF in two parts (Part 1, Part II). It insists on the importance of warm climate periods for human development, and that climate changes are a fact of Nature (mostly the Sun and volcanoes): "Die Sonne ist der Hauptakteur". Read more comments in my blog or here. Expensive energy kills people Dr. Roy Spencer: "UNICEF estimates 22,000 children die each day due to poverty. In contrast, no one is known to have ever died due to human-induced climate change. I predict that modest warming (whatever its cause) and more CO2 will turn out to be better for life on Earth." Faux polar bear figures Read Prof. Susan Crockford's comment in FP. Diskussion um Klimaschutz lächerlich How inconvenient: veteran meteorologist Klaus Hager says " Ich prüfe gerne Fakten und will zum Nachdenken anregen, nicht alles ungefiltert zu schlucken, nur weil es dem Zeitgeist entspricht." Read Hager's paper on the advantages and disadvantages of measuring automatization. The switch from mercury glass thermometers to modern Pt100 sensors and different methods of calculation could have caused a virtual warming of + 0.9°C ! Fantasies about global warming Read this comment by Lawrence Solomon in the Financial Post: "Today’s youth, having been force-fed an unrelenting diet of hype and fear, will have trouble stomaching more". Ethics and Climate Change Policy A very important new report by Peter Lee with an excellent foreword by Dr. Peter Forster, bishop of Chester (and a chemist). Faux polar bear figures Read Prof. Susan Crockford's comment in FP . Diskussion um Klimaschutz lächerlich Read veteran meteorologist Klaus Hager :" Ich prüfe gerne Fakten und will zum Nachdenken anregen, nicht alles ungefiltert zu schlucken, nur weil es dem Zeitgeist entspricht." Read Hager's paper on the advantages and disadvantages of measuring automatization. The switch from mercury glass thermometers to modern Pt100 sensors and different methods of calculation could have caused a virtual warming of + 0.9°C ! Greenland ice decrease seems to halt Will it start to increase in 2015? Read here, here and here.